HP Envy 5020 is a feature-packed inkjet multifunction printer that might impress every home user. The device is supported by a list of advanced features including Cloud printing, HP Instant Ink technology, automatic duplexing and Amazon Alexa. The printer is 5.5 kg in weight and 128 x 445 x 367 mm (H x W x D) in dimensions. It is included with a 5.5 cm mono touchscreen that allows navigating through the functions easily. 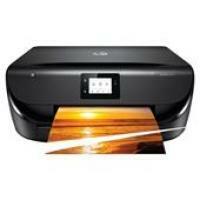 The printing speed of the device is better compared to other HP printers. For black and white printing it goes up to 9.8 ppm (ISO) and for the colour, it goes up to 6.8 ppm (ISO). The images produced by the device are likely to impress photographers with professional quality, crisp borderless photos. In fact, the HP Envy 5020 Ink cartridges integrated with the latest HP Instant Ink technology save up to 70% on any photos, be it mono or colour. The input tray handles 100 pages at a time and the output tray manages 25 pages. In addition, the machine facilitates printing via PC, smartphone and tablet without the need for cables. HP offers printing app both for Android as well as Apple users. The printer allows printing both for Windows and Mac PCs. HP Envy 5020 inkjet all-in-one has everything to appeal to the home users. It has some of the latest features that can truly go with the expectations of a modern home. Mobile printing combined with HP Envy 5020 Ink cartridges contributes to productivity and convenience. How to clean the cartridge contacts for HP Envy 5020 printer? (Make sure that the HP Envy 5020 ink cartridge is installed in the printer as soon as possible. Do not leave the cartridges out of the printer for more than 30 minutes, else it would damage the ink cartridges). For cleaning, the printer power is turned on. Open the cartridge access door and remove the cartridge shown in the error message. With a floss-free cloth, wipe the contacts only. Locate the cartridge contacts in the print carriage. Wipe the contacts in the print carriage with a dry swab. After the whole process, reinstall the HP Envy 5020 ink cartridge and close the cartridge access door. Check whether the issue is resolved or not. If you still receive the error message, turn off the printer and turn it on again. Note: If only one HP ink cartridge is causing the problem, you can remove it and use the single-cartridge mode to operate with only one cartridge. What to do if the HP Envy 5020 pages are slent or skewed? You need to make sure that the paper you have loaded in the input tray is properly arranged to the paper-width guides. If necessary, pull out the paper input tray and reload the pages in a proper manner (the paper guides should be aligned correctly). Load the pages into the printer, only when it’s not printing. Q. What is the monthly duty cycle of the HP Envy 5020 printer? A. This printer has a monthly duty cycle of up to 1250 pages. Q. I have a Windows OS computer. How can I check the estimated ink levels of the HP Envy 5020 Ink Cartridges inside my printer? On the printer control panel home screen, touch the ink icon to check the estimated ink levels. Open the HP printer software and in the printer software, click Estimated Levels. Open HP Smart on your mobile device. The estimated ink levels of your cartridges will appear at the top of the screen, beside the picture of the printer. Q. How many pages can each of the compatible HP Envy 5020 Ink Cartridges print? A. Both the colour and black compatible HP Envy 5020 Ink Cartridges can print up to 300 pages each. Q. What is the maximum printing resolution supported by the HP Envy 5020 printer? A. In monochrome printing, the best resolution is of up to 1200 x 1200 rendered dpi. In colour printing, the best resolution is of Up to 4800 x 1200 optimised dpi. Q. What types of media can HP Envy 5020 print on? A. It can print on Plain Paper, Photo Papers, Matte Brochure or Professional Paper, Matte Presentation Paper, Glossy Brochure or Professional Paper; Other Photo Inkjet Papers, Other Matte Inkjet Papers; Other Glossy Inkjet Papers, Plain Paper and Light/Recycled Paper. Q. If I don’t have a debit or credit card, can I still make payment for your compatible HP Envy 5020 Ink Cartridges ? A. Please do not worry. You can still make payment via PayPal, Laser card or American Express for our compatible HP Envy 5020 Ink Cartridges.